It appears that Bond producers Barbara Broccoli and Michael G. Wilson are moving full-steam ahead with the untitled 22nd James Bond film, a follow-up to Casino Royale, by hiring a new screenwriter and director. Oscar-winning screenwriter Tom (The Bourne Ultimatum) Stoppard is "in talks" to pen the screenplay and Neal Purvis and Robert Wade were previously confirmed as working on the script. For Casino Royale, Purvis & Wade fleshed out the basic story and structure before Oscar winner Paul Haggis was brought in to polish dialogue and character. Eon Productions are also "in negotiations" with South African-born director Roger (Changing Lanes) Michell to helm Bond 22. Michell is in keeping with the kinds of directors the Bond franchise has recently been employing: notable but hardly A-list non-American filmmakers, such as Roger Spottiswoode and Michael Apted, who are better known for character-driven dramas than they are for big action movies. Royale director Martin Campbell is an exception, whereas Lee Tamahori gained attention for films such as Once Were Warriors before tackling Die Another Day. (Then gained a different sort of attention by dressing up as a woman and hiring himself out as a prostitute). Daniel Craig will return for Bond 22 which it has been long suggested will lens either later this year or early next year to cash in on the irresistible "007 in '007" release date. 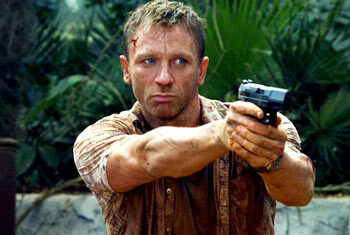 The next two sequels will reportedly follow a story arc established in Casino Royale. Did they get anywhere with that gay Bond that I suggested??? We have'nt heard anything from Dutton recently, I reckon he's on location on the isle Gaybos "shooting" a scene where. I don't think a Homosexual James Bond would work lad. Best keep "that sort of thing" to movies like Brokeback Mountain where one can avoid seeing it.